2015 FEBS/EMBO Course on Mitochondria in life, death and disease. In recent years enormous progress and conceptual advances have expanded the field of mitochondrial biology to be central in almost all aspects of cell physiology. Apart from constituting the ‘cellular power plants’, mitochondria form a complex metabolic network which is crucially involved in cell survival, apoptosis, redox control, protein biogenesis and assembly, calcium homeostasis and many metabolic and biosynthetic pathways. Many aspects of mitochondrial function have come into the foreground and appear to be far more complex than previously assumed. It is therefore of utmost importance to bring together students, young researchers and established leaders in different aspects of mitochondrial biology to teach and discuss the newest developments in this field in a unified context of mitochondrial biology. regulation of mitochondrial damage (mitophagy, oxidative stress, aging). Young students and postdocs will have many opportunities to meet and discuss with established PIs in an informal context, during ‘meet the PI’ sessions, informal round table discussions and poster flash presentations. 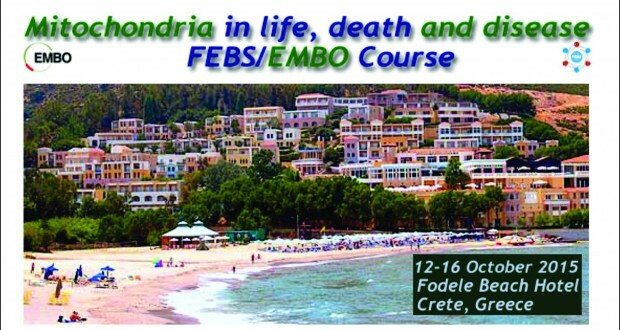 The 2015 FEBS/EMBO Course on Mitochondria in life, death and disease (MITO2015) will take place between the 12th and the 16th of October 2015, at the Fodele Beach Resort on the island of Crete, Greece. Please, use the navigation bar on the left to find information about the course venue, registration, accommodation and abstract submission. All course questions should be directed to Mrs. Georgia Choulaki (MITO2015 Secretariat,info@mito2015.gr). These pages will be regularly updated to include the latest information about the course.